Capcom's insane brawler headed to the App Store with 56 characters, over-the-top combos and sweet 2D graphics. For the longest time, Marvel Vs. Capcom 2 was among gaming's most hard-to-find titles, and it wasn't uncommon to see copies on eBay selling for well over $60. Now we can't escape Capcom's furious 2D beat-em-up. It's almost everywhere, even mobile. 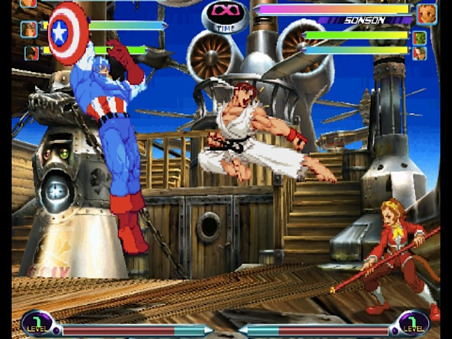 Yup, Marvel Vs. Capcom 2 will debut on iOS, presumably in the near future. The game will retain all 56 playable characters, along with crazy combos and frantic three-on-three tag action. That said, we still don't know how the controls will work, but from the looks of these screens (and the obvious lack of a virtual d-pad/buttons), it wouldn't surprise us to see a touch feature not unlike the one used in Ultimate Marvel Vs. Capcom 3 for PlayStation Vita. Look for the game April 25 for iPhone and iPod Touch, because for some bizarre reason, Capcom refuses to properly support iPad.